“May Mary, Patroness of the United States, help us to heal from our differences and build a nation where the rights of life, liberty, and the pursuit of happiness are a reality for all men and women, especially the unborn.” Archbishop Jose Gomez, Nov. 2008. 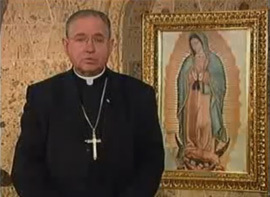 Archbishop Jose Gomez has been named as the new Archbishop of Los Angeles. There are many reasons to rejoice in his appointment – pro-lifer’s can rejoice that our new shepherd has a heart for the unborn and the life issues of our time. Here are links to some of his respect life columns, sermons and writings.